Please edit the page properties (see here for instructions) to change the title to the name of the archaeological site you will be writing about, then replace the Italicised instructions below with your entry... If you want to know how to add e.g. additional images, podcasts, etc., please see this page. If copying from word, rather than using CTRL-V, please click the small "paste from word" icon (with a 'w') which neatens up the formatting. Serapeion C consist of a long narrow rectangular with an external propylon on the southern side, and surrounded on all four sides by stoas and between two long parallel colonnades the paved approach is bordered by two small sphinxes alternating with built altars. The approach ends in a paved court with stoas on the two sides; in the middle of the northern side is the temple of Serapis with sekos, pronaos and prostasis having four columns at the entrance. On the eastern side of the court is the temple of Isis, a doric temple with two columns in antis which the Athenians repaired in 135 BC. Serapeion B is a small building; a court with a stoa lay on the eastern side togheter with a cistern; in the centre is a large room and on the west three smaller room and a shrine dedicated to Serapis. Serapeion A is at a lower level and consist of three architectonic elements; a court with two stoas on the sides and between the naos, a simple oikos. Below the naos was a small cistern supplied with water from the river. The site was discovered for the first time by the greek archaelogist Stamatakis, who was carrying on the work started by A. Lebègue in 1873. Stamakis began to excavate on a terrace-like plateau, which later will be showed as the site of the temples to the Foreign Gods, Egyptian and Syrian. He found also inscriptions that allowed him to locate the great temple of Sarapis. The excavation was actually completed and explorated by Hauvette-Besnault in 1882. From an inscription founded in the Serapeion A, on a marble pillar, we can retrace the story of this site. Isis: in the Egyptian Religion, Isis was sister and wife to Osiris. Myth says tells us that when Osiris was killed by his brother Seth, Isis went in search of the body and eventually revives him. Herodotus identified her with Demeter, not a coincidence therefore, if Isis is related to many mistery cults throughout the Hellenic World. Sarapis: his name is derived from Apis, a god who took the form of a bull and was worshipped in Memphis from early in Egyptian history. Under Ptolemy I, new importante to the human representationt of Apis, who may already may have been receiving cult worship in Memphis as Sar-Apis, or linkage of Osiris and Apis. Is associated with many gods connected with the boundary between life and deat, including Hades and Asclepius. Plutarch identified him with Pluto, fertility. He was revered as a patron of Ptolemaic dynasty and the city of Alexandria, also protector of distressed. - An altar dedication to Isis is the oldest of all the Delian inscriptions relative to the Egyptian Cults, and belongs to the early third century. - Serapeion A's inscription tells the story of the introduction of Sarapis in Delos. Apollonius, an Egyptian of the priestly class, came from Egypt bringing the image of his god, whose worship he, privately, conducted in his own house. His son made the same. The grandson (the one who tells this story) succeeded to the priesthood, and the god commanded him, in a dream, to build a sanctuary for he desired a new one and gave him instructions where and how to be built. Six months after the temple was built. But "wicked" men opposed the god and his temple, probably because Apollonius did not seek the requisite permission for observing foreign rites on Delos. Then a miracle happened, the opponents being struck dumb and the opposition ended. The inscription is dated before 167 BC, it allows us to date the birth of Serapis' cult before 300 BC. -From about 220 BC, inscriptions give evidence of religious associations usually deriving their names from the days of the month on which they met; they are private associations and include both men and women. - About 179 BC the Hieropoei themselves were in charge of a temple of Sarapis, and another of Isis, and controlled their revenues. Delian authorities decided to take control of the cult, which was growing fast. The cult became so public and official. - From a senatus-consultus though, we know that the Athenians, having taken again possession of Delos, tried to shut down the temple. Indeed Demetrius, a descendant of Apollonius, after 166 BC appealed to Roman Senate, which ordered the reopening of the sanctuary. specify activities, known dates, and ancient sources. The archaeological complex is important for what it shows. It produces indeed, a proof of the Egyptian influence upon the island. 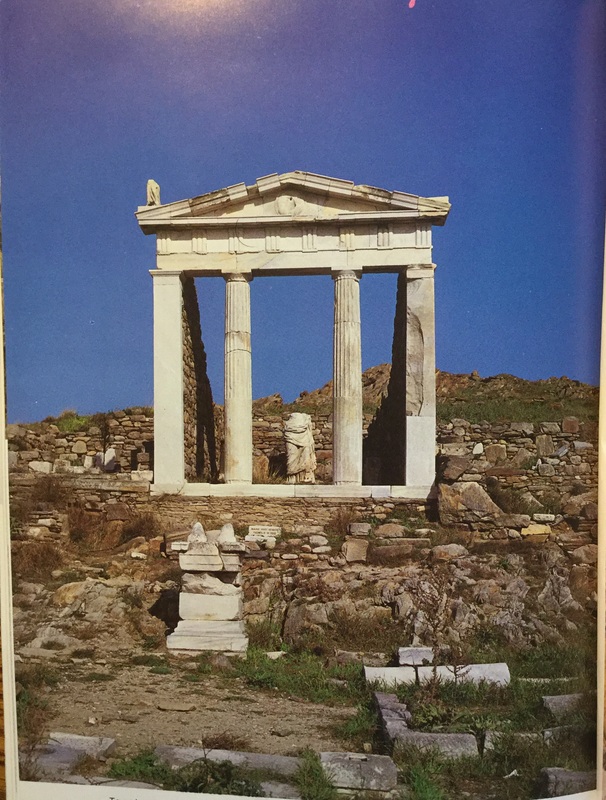 Delos was freed from Athen's control in 315 B.C. and few years after, altough it remained indipendet by name, it joined the League of the Island, which was lead by Ptolemy I, King of the Egypt. Egyptpian influence grew under the reign of Ptolemy II: annual festival were established in honor of his father and wife, Delian's Nauarch and Nesiarch seemed to be chosen by the king and after his death the Delians proclaimed him a God. That being so, the cult of Sarapis being introduced was not a coincidence, for Sarapis was identified as the official patron of Ptolemaic dynasty. A large part of the dedications and offerings in the Egyptian Temples was made by the Italians, namely Rome, which after the Ptolemaic influence were the most important and best organized group on the island. Cumont suggested that Rome may have introduced the Egyptian Gods in Italy after having taken up thei cults right there in Delos. Roman interest gives testimony of the great importance taken on by the Egyptian Cults in Delos, so much that it was possible to equate it with the Apollonian Religion. For this reason Delians authorities decided to take control of the cult, so that we can see it performed by Delians citizens in late II B.C., while before was performed only by Egyptian descendants. 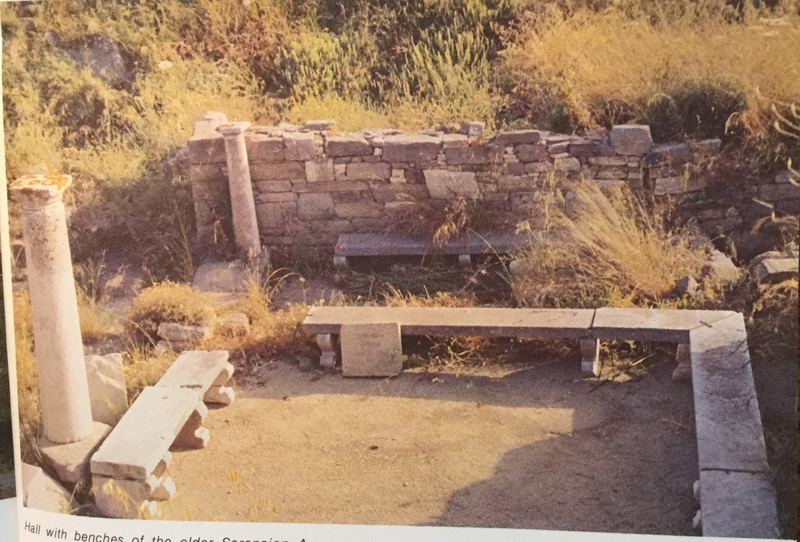 Delos' cults are only a part of a religion that under the Ptolemaic reign of Egypt was spreading all over the Mediterranean Sea, nonetheless in none of the Greek cities we find more inscriptions related with the Egyptian Religion than in Delos. Indeed Roussell identified almost 60 inscriptions on the Island. As I said, the cults became public quite soon. The popularity which it reached implies an audience all-encompassing, composed both by men and women. From dedications and offerings we know that also the Italians used this site. The senatus-consultus was found near the lower basin of the Inopus in 1911. It was edited by Cuq: "Le senatus-consulte de Delos de l' an 166 avant notre ere" C.R.A.I. XXXIX, 1912, pp. 139-161. 1- To enter footnotes, put  in your text above, and place the footnote down here. 2- If you press "shift + enter" it will insert a line break without any paragraph spacing. The temples are situated in M. Cynthus’ area, in the lower level of its western slope, togheter with Syrian Gods’ area. Serapeion C is below an Heraion dated back to 500 BC. Serapeion A and B (both olders than C, while A is the oldest one) are in the Inopos Valley, on the left of Serapeion C (giving the back to the sea), close by the Inopos, note the equivalence between the Inopos and the Nile made by Callimachus in his Hymno at Delos (vv.206-208). 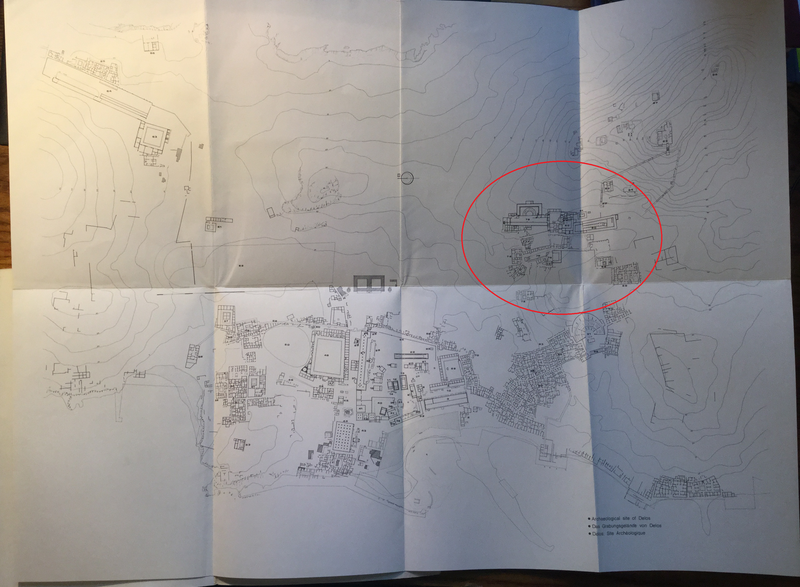 Please add the location here. Also, search for it on Pelagios (click here) and add a link to "further information" about the place. You might even want to embed a map to show it within the context of other archaeological sites from vici.org, like below. To find out how to do this, see the further instructions page.